ColecoVision Atari Converter / Expansion Module #1. "You can play all Atari 2600 games on a ColecoVision, but you can't play ColecoVision games on Atari"
S/N #: 000503 Model # 8A-7499. Expansion Module No. 1 allows all cartridges compatible with the Atari 2600 VCS to be played on CBS ColecoVision console. 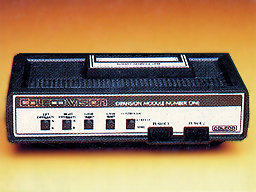 When the Expansion Module is plugged into the Expansion Module Interface, the widest possible library og video game cartridges can be played on the CBS ColecoVision system. Alternatively, existing Atari owners can purchase the CBS ColecoVision videogame system and still make use of their existing software library. Game play can be controlled using CBS ColecoVision game controllers which plug into the Expansion Module No. 1. Coleco Industries was quick to release their Atari converter for Colecovision. They found that they could fool Atari by completely switching components. 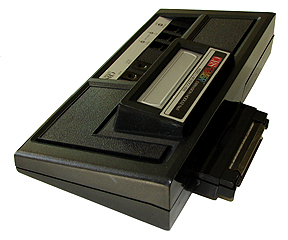 After the release of the Expansion Module # 1, released Coleco Industries subsequently a unique clone. So here is it, the Atari 2600 single clone called: Atari Gemini. Coleco Gemini was only on the market in a short time. Coleco developed initially this prototype of the Atari module. How a game cartridge were inserted, has ColecoVision.dk no information about. Both were prototypes and was never released to the public. The prototypes shown on the photos above, could probably have worked. But Coleco decided before its release that it should have the oblique design. The final Atari 2600 Converter. Atari was not completely satisfied with Coleco Industries way to attack things, so Atari went to the courts and the defendant promptly Coleco Industries for millions of $. 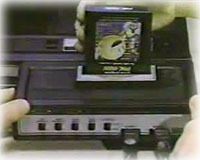 is intended to allow its VCS compatable cartridges to be played on Colecovision's home video game unit." Coleco felt for sure that they had the right on their side, so Coleco fought back against Atari Corporation. "Coleco responded by filing a $ 500 million counterclaim, charging violations of antitrust law. Coleco said it does not infringe any valid patent and that the Atari lawsuit was without merit." Coleco made subsequently an agreement with Atari and the Court. So Coleco Industries undertook to pay royalties to the ATARI Corp. (Warner Communication). Atari and Coleco could see potential for both of their systems, and they start to make games for each other. Atari made a lot of games for ColecoVision and Coleco Industries created some games for the Atari VCS System. Atari made some fabulous fine games for Coleco, but rumors has it that Coleco did not make their games so fine for Atari. 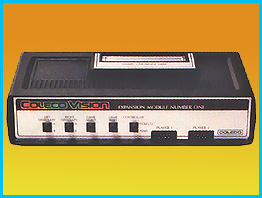 Another thing Coleco was not fully aware of was when Coleco had launched their Expansion Module # 1. They forgot that some of those who make cartridges actually have a different size than the regular size. These were, for example, Tiger Vision cartridges. 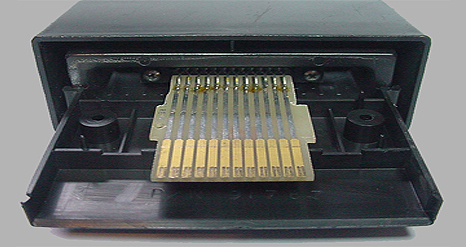 Some of these cartridges like Tiger Vision games would not have physical electrical contact, because the plastic cartridge case did not fit the hole in the expansion module. Therefore, rather quickly after it was discovered made a small extender that you then mounted in the cartridge hole before applying the aforementioned games. So you should just call Coleco or Starpath back in the early 80s, and they sent you an adapter for free. All you had to do was to inform about your Expansion serial number and your address over the phone. When it arrived there was attached a note which said it had a $ 60 value. But Coleco were only supplying one per household and not one per each Atari converter that a person owns. It cost Coleco money, since they offered them for free for those who asked for one back then. The device did that the Atari 2600 adapter was 100% compatible with all Atari 2600 cartridges. The pictures above show how the adapter looks and how it is mounted. 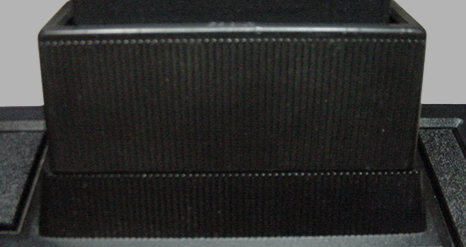 A closeup of the extender. As you can see on these pins, the signal passes straight through. Coleco games available for Atari VCS 2600, Mattel Intellivision. 241125 - 2451 Donkey Kong Jr.
"The Atari module was actually a nearly complete Atari game system. About all we used from Colecovision was the power supply and perhaps the video modulator (I forget the details). It gave us full compatibility with Atari games because it was an Atari system. I don't think the Z80 or graphics processor was used for anything when using the module." Atari was one of the biggest players on the game market. There was around 10 different clones on the market, they all worked fine, amd there is more clones and flash versions than ever before. The American video game crash in 1983 was a massive setback for the former games industry, which took place from 1982 1985. The massive decline hit Wall Street rather quickly and Atari lost at least $ 500 million in no time. Here is the headlines on over 30 years history. 1971 pitures Nolan Bushnel finishes his studios, and develop the Pong and Computer Space. 1972 are coming Nolan Bushnel founded the company: Atari together with Ted Dabney. 1973 later. The first Pong-machines see the day of light in the arcades all over the world. 1975 You can now get a pong in a homeversion. It goes quickly with the imitating around the world. 1976 They developed a game machine named Atari VCS. 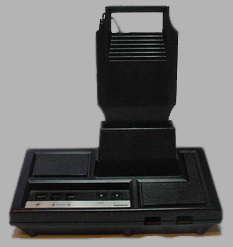 1977 Atari VCS launced, and nicknamed: "Heavey Sixer", because it was mounted with 6 bottons and was pretty heavy. 1978 Atari VCS is now officially Atari CX 2600, and two bottons for differculty is placed on the back on the Atari. 1979 Atari launced the Atari 400 and 800. 1982 Atari introduced the 5200 with a better sound. Internaly was the name Pam. 1982 When Atari needed more game designers, they founded Activision and Nolan moved a few people from Atari to Activision. 1983 Jack Tramiel is now "the man" behind Atari. 1984 Atari develops Atari 7800 under the name Maria. 1985 Atari 260ST, 520ST and the 130XE see the day of light. 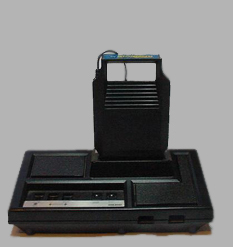 1986 Atari launced the 7800 in two variants, at the same time presents Atari 2600 in a Atari 7800 design. 1988 Atari IBM Mega ST and Atari PC. 1990 The people behind Amstrad CPC+, develops the game machine GX4000. 1991 Atari ST Book Portfolio. 1992 Atari develops and launch the PC: Atari Falcon. 1993 The game console Jaguar with 64 bit. Risc prossesor develops and launced by IBM. 1994 Jack Tramiel are in negotiation with Time-Warner about to sell some parts of Atari Inc.
1996 Jack sold over the half of Atari, and Jack's family keep themselves 42% of the stocks. 1998 The Toy giant Hasbro takes over the stock market in Atari. 1999 Hasbro has buying the rights to Atari Jaguar. 2002 Hasbro and Infogrames came with a announcement: We split Atari among us, -fifty fifty. 2004 Atari launced Atari Flashback as a plug and play with 20 build in Atari-games. 2005 Atari 2600 Miranda launced under the name Flashback 2, now with 40 build in Atari-games. Latest: My CBS ColecoVision UK Atari Converter does not work with my French CBS Scart ColecoVision. You are always welcome to write and edit topics on ColecoVision.dk, just send an e-mail. Last updated April. 28. 2018. Last updated November. 10. 2017. Last updated August. 13. 2017. Last updated April. 02. 2017. Last updated March. 07. 2015.